Kimchi Crisis Leaves South Koreans In A Pickle It's kimchi season in South Korea, but a shortage of napa cabbage -- the key ingredient in the spicy, fermented dish -- has created a mini crisis in a country where kimchi is served at almost every meal. It's kimchi season in South Korea, but a shortage of napa cabbage -- the key ingredient in the spicy, fermented dish -- has created a mini crisis in a country where kimchi is served at almost every meal. 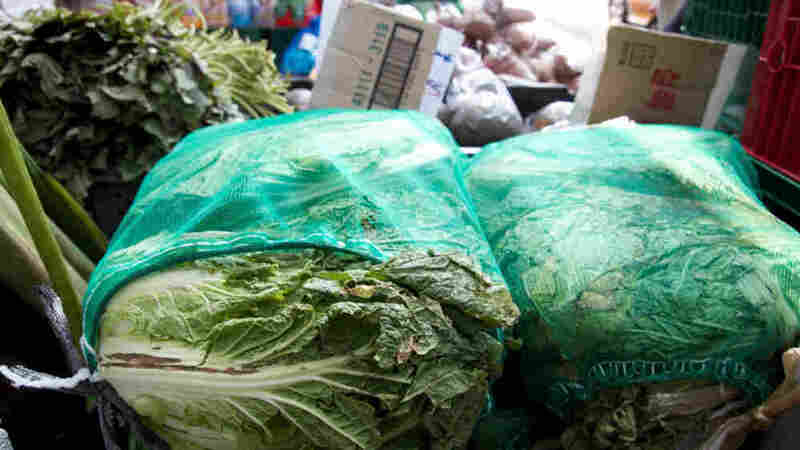 Seeking an immediate substitute, the government temporarily suspended tariffs on Chinese-imported cabbage and other produce this week, part of a plan to rush an additional 100 tons of the staple into supermarkets and stores. The Seoul city government, meanwhile, is providing the busiest markets with 300,000 heads of napa cabbage at just 70 percent of the market price -- enough to feed 10,000 households. Kimchi, made of cabbage fermented in white radish, garlic and chili paste seasoning, is low in calories and rich in vitamins. It is so ubiquitous in South Korea that it is provided as a free side dish in all local restaurants from steakhouses and Chinese restaurants to pizzerias. At the Well Being Market in Seoul, a package of three small heads of cabbage was going for about $20. That was far too high for one elderly woman, who took a good look at the quality and then walked away. But market attendant Kim Soo-ok says other people are buying it -- and fast -- because they can't live without kimchi. People who need it, buy it, Kim said through a translator. She added that other shops were charging up to $14 for a single head of cabbage. 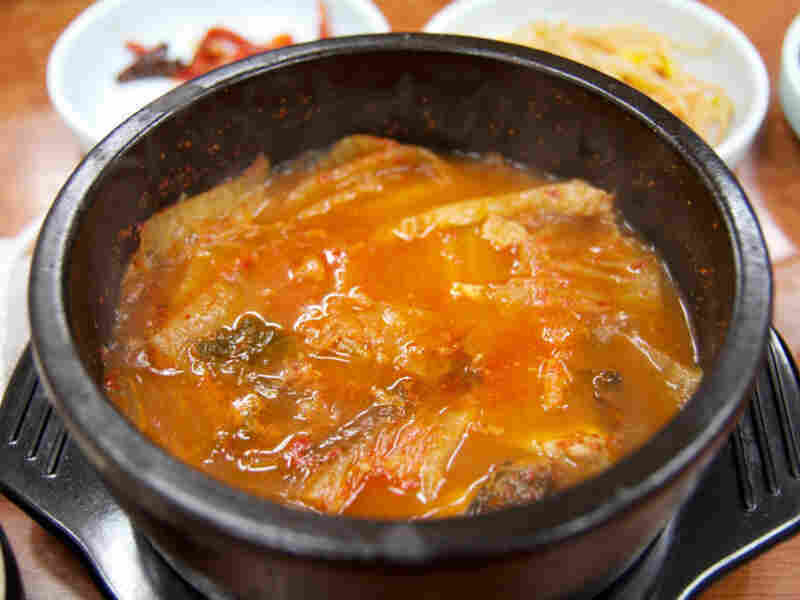 Koreans can't live without kimchi, said Pak Sung-hoo as he dined on a kimchi-based stew at Namsan Kimchi Jigae restaurant in Seoul. Even if the price of dishes made with kimchi goes up a few dollars, he said, he's willing to pay. One man was arrested Sunday for allegedly stealing 10 heads of cabbage from a field in South Korea's northeastern Gangwon province, local police said. "I could see why he did it," Kim Chang-wan, a Seoul businessman, said Monday of the alleged theft. "I have to get my kimchi fix with every meal or I'm not completely satiated." Concerned market sellers and produce distributors are hoping that Koreans can ride out the kimchi crisis by eating other varieties of kimchi, like the radish or green onion kind, as a substitute for the most common and popular napa cabbage kimchi. This year a freakish combination of cold temperatures in the spring, an extreme heat wave in the summer and torrential rains in September caused crops to fail and produced a surge in food prices that pushed the country's inflation rate to a 17-month high in September. Napa cabbage harvests dropped 40 percent to 151,000 tons in the nine months through September, compared with 252,000 tons in the same period last year, due to "abnormal climate changes," the Ministry for Food, Agriculture, Forestry and Fisheries said. The Agriculture Ministry said that while production will continue to drop this year, it expects prices to stabilize by November in time for "kimjang" season -- the annual rite in the fall when kimchi is traditionally prepared and packed into giant pickling jars and buried in the ground to ferment during winter. Though the mouth-scorching dish can be readily bought in stores, many people make it on their own at home -- a laborious process that requires it to be stored and fermented during the winter months. Many homes have special kimchi refrigerators that regulate temperatures to maintain the preferred level of fermentation. "I don't know how long I can keep ignoring my grandkids' and my husband's demands for kimchi every meal," said Kim Hyung-sook, who lives in northern Seoul. "You're not Korean if you don't eat kimchi three times a day." NPR's Doualy Xaykaothao reported from Seoul for this story, which also contains material from The Associated Press.